Dyslexia, or developmental reading disorder, is one of the most common learning disabilities in children. In fact, it was the first learning disability identified and treated in the public school sector. The International Dyslexic Association reports that one in ten individuals have dyslexia. 1881 – Dyslexia was identified in 1881 by Oswald Berkhan, a German physician. 1887 – The term “dyslexia” was first used in 1887 by Rudolf Berlin, a Stuttgart ophthalmologist. Berlin used the term to refer to a case of an intelligent and physically capable young boy who had a severe impairment in learning to read and write. 1896 – W. Pringle Morgan, a British physician, published “Congenital Word Blindness” in the British Medical Journal. In it, he described the case of “Percy” a otherwise normal 14 year old boy who couldn’t read or write. During the intervening years, a great deal of study has been done to better understand and treat this condition. 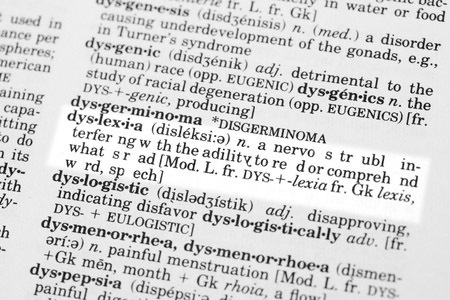 Sometimes called a hidden disability, dyslexia often goes undiagnosed. About 1 in every 10 people have Dyslexia. Most people who are dyslexic are of average to above average intelligence. It is neurologically based and often genetic. With early recognition and specialized approaches to teaching, most dyslexics can learn to read. Dyslexia is associated with differences in brain activation and brain function. There appear to be anatomical differences, including symmetry between the right and left sides of the brain, when compared to those without a reading disability. There is, however, no single spot in the brain that is associated with reading disabilities. The neurological difficulties that can cause dyslexia often result from a deficit in the phonological component of the language center in the brain. Reading disabilities are believed to be a result of central auditory processing and/or visual processing difficulties. Slow auditory processing, poor sound discrimination and weak phonological awareness not only affects listening, but also the decoding of the sounds of language into written form. Children with decoding difficulties may guess at the sound of words, make up words or make up the story they think they are reading by looking at the pictures. Dyslexia can also be the result of a visual perceptual challenge, either with visual sequencing, visual memory or both. The visual skills needed in the function of reading are hugely discussed, in many journals and by many experts in the field of learning disabilities. The visual tracking function of reading involves rapid lateral movement of the eyes along the line and from one line to another, picking up clusters of letters and transmitting them to the brain, which gives them their meaning. The ocular muscles of the eyes involved in visual tracking are largely controlled by the cerebellum, the part of the brain which receives much of its information from the vestibular system. The vestibular system sends signals from our inner ear to the neural structures that control eye movements, and to the muscles that keep us from falling over. A disconnect in the cycle of hearing sounds and seeing letters and words causes reading disabilities. Difficulty hearing syllables within words and phonemes (sounds) within syllables: Example: Grj wshngton ws the first prsdnt. May have difficulty sequencing: saying the alphabet, days of the week, months of the year, counting or understanding concepts such as left and right. Dyslexia also reduces reading experiences that can lead to a decrease in vocabulary growth, and background knowledge, not wanting to read, or not finding joy in the world of books. Programs exist for these students, but as a parent you need to advocate for you child! If you need help getting the system to work for your child, we can act on your behalf. We will go to your school with you and your child and act as a Parent Liaison on your behalf. We will fight for your child’s right to the limited resources available! Remedial reading interventions for a child with dyslexia include direct instruction in learning the code of sounds and letters. This is often done through the use of a special instructional program curriculum. These programs offer direct, intensive instruction in phonics, spelling, and writing. These approaches are specific for students with dyslexia because they offer multi-sensory approaches that offer children opportunities to learn through seeing, hearing, and touching. They also utilize a large amount of repetition that helps children with dyslexia learn. Audio tapes – These can help a struggling student stay in the game. For instance, a 4th grade student reading at a 2nd grade level may use audio tapes of a 4th grade novel so that she can participate in class discussions about the novel. Dictating Work – A child with weak handwriting and spelling may be allowed to dictate a story to a teacher or aide who will write it for him. This allows the child to express her ideas without having to struggle with weak writing abilities. Text-to-speech software – that reads and says on-screen text for students, or adults when their job requires extensive reading within a short period of time. Books on tape are available through several services, including public libraries. The brain–body connection in relationship to the dyslexic student learning to read cannot be overlooked, nor overemphasized in light of present day brain neuroplasticity and neurogenesis research. We know that nerve networks are formed through movement and touch. Reading a book requires subtle eye movement as well as subtle listening; just like kicking a ball requires large motor movements. With Integrated Learning Academy’s brain based tutoring program, the physical skills of learning through experiencing Brain Gym processes and exercises, weaved into multi-sensory direct curriculum instruction, are the ticket to ease and connection as well as developing the physical skills necessary for easy reading in the dyslexic brain. It is the simultaneous use of the visual, auditory, and kinesthetic/tactile pathways in the brain to enhance memory and learning. You’d be amazed at the difference intentional movement (Brain Gym) makes in one’s ability to sound out words, increase fluency and comprehension while restoring joy and fun to the learning-to-read process. Difficulty with written language has a life changing impact on individuals with dyslexia, their families and communities. Dyslexia does NOT define a person; there are numerous success stories for dyslexic people. For many with dyslexia their difficulty learning to read and write takes its toll on their self image and they begin to believe they are dumb or stupid. Nothing could be further from the truth! Remember in the early days of understanding dyslexia, teachers noticed that otherwise bright, intelligent students were having difficulties learning to read.